Samsung chose its European Forum in Prague to announce its first-ever Ice Cream Sandwich powered tablet, the Samsung Galaxy Tab 2.With so many iterations of the Galaxy Tab, it is easy to forget just which Tab this is the sequel to. It is in fact the successor to the first-ever tablet Samsung released, the original 7-inch Galaxy Tab.While its specs may not have changed that much in 18 months, the chassis certainly has. 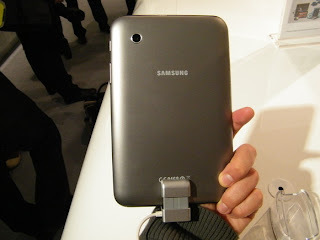 While Samsung opted for a thick slab of tablet with a white back first time around, the new Galaxy Tab as a more rounded silver back. Its style is much more in keeping with the original Samsung Galaxy S smartphone. Powering the tablet up and we impressed by the speed of the thing. 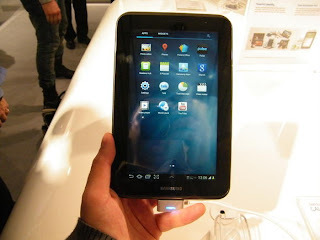 Given that the Samsung Galaxy Tab 2 has a 1Ghz dual-core processor, it didn't blow our mind speed wise but flicking through varying menus didn't muster up any lag and flicking from different apps – we went from the Social Hub to camera and the action didn't expose any weaknesses in the Galaxy Tab 2's power. 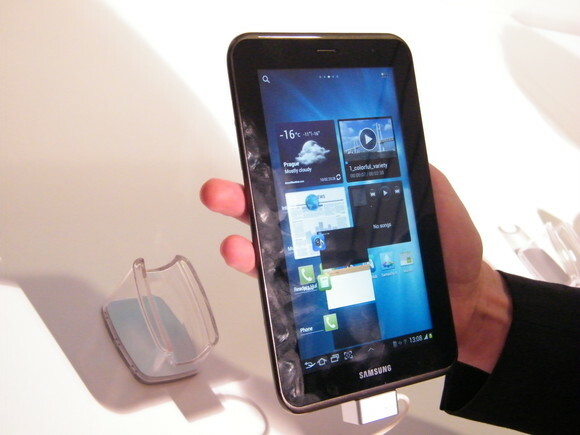 In the hand, the Samsung Galaxy Tab 2 certainly feels a lot lighter than its predecessor – in the specs list Samsung has it badged at 344g. The lack of jagged edges makes it fit the hand a lot better. 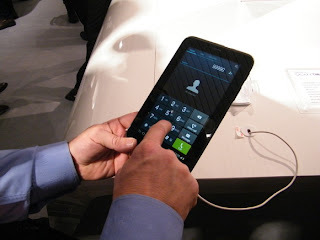 And while we have never been truly enamoured with the 7-inch size for a tablet, it was a decent enough device for browsing the web and flicking through Twitter and the like. When it comes to cameras, the Samsung Galaxy Tab 2 has a 3MP snapper on the rear and a VGA camera on the front.Although a conference room isn't the best place to take an image, the camera worked well with the mix of bright white and blue, the two colours which dominate Samsung's stand. When it comes to connectivity, Samsung has significantly juiced up its AllShare service and actually made it work anywhere. 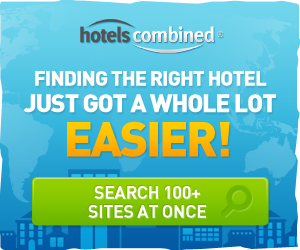 Before, where it was for those in the same house – a bit like Bluetooth – this has been expanded to work anywhere, as long as you have your device linked to the service. Depending on your tastes for Samsung software, you will be pleased to hear that there is a new hub. Called the Video hub, this is where you can get your movie content and works in the same way as the Music and the Game hub.There's also an app recommendation engine on the tablet as well. Other than that, the Samsung Galaxy Tab 2 is a decent update for those who like the 7-inch tablet size but it does lack wow factor when it comes to specs. 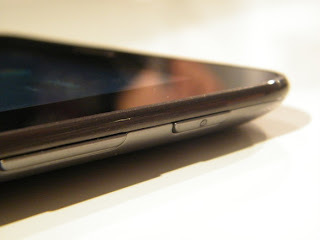 This is purely Samsung's fault, having already released the more powerful Samsung Galaxy Tab 7.0 Plus (1.2Ghz) and the Galaxy Tab 7.7 (1.4Ghz). 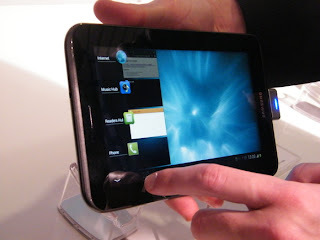 But, and this is depending on price which is still TBA, the Samsung Galaxy Tab 2 is a great sign of things to come for ICS on tablets.The Samsung Galaxy Tab 2 UK release date is March and will come in 8GB, 16GB and 32GB flavours and the option to upgrade memory through a microSD slot.